We also wanted to create a quiet space that was a response to the busy-ness of a city. London. Somewhere people could come to retreat to just for a few moments, at the beginning of their day. There’s something about the early hours. I’ve spoken about this before but it’s worth re-mentioning. In those early hours of a city you can feel the potential. A quietness that at SYL at 06:30 is filled with the sound of breath. A yoga space/shala is just a room in a building with four walls. A simple space. It’s the intention that’s created within those walls that helps it to become a place for contemplation, of people trusting to be able to find something deeper within themselves. The intention of SYL has always been to help people uncover things in this way. To create the space for that. Importantly, it’s to realise that the space you come to is also just a space you hold in yourself. In time. It’s learning that that space is movable, transient and can be taken anywhere. 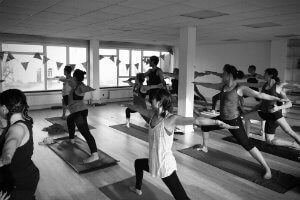 A yoga space is just a room in a building with four walls. It’s the intention that’s created within those walls that helps it to become a place for contemplation. Stillpoint has always been an idea, a way for me as a teacher to communicate something that may have value to someone I meet. Yes, we teach and practise Ashtanga vinyasa yoga. But it’s more than that. 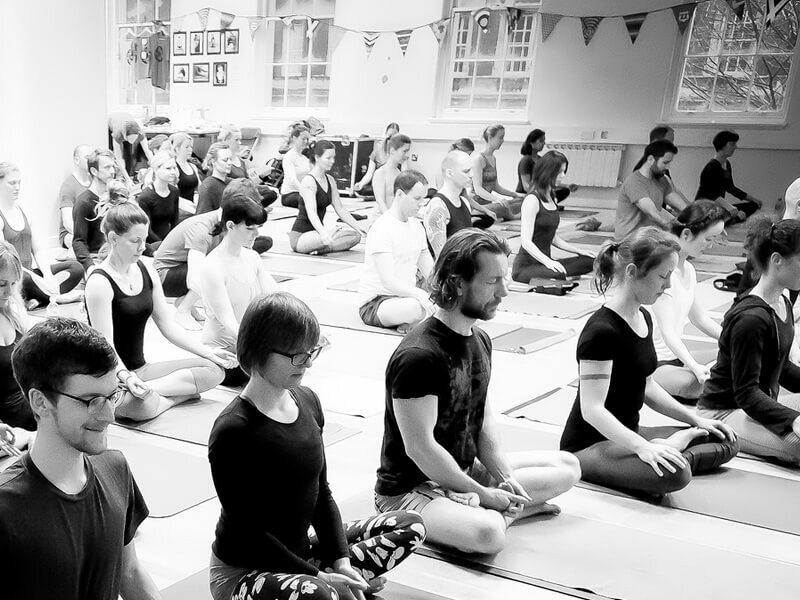 We’re helping people to find what it takes for them to unveil the practice of yoga in their lives. We do that by helping people to find a practice for themselves, so that they’re in control of finding depth to their experience. We’re all trying to make sense of life in our own ways. Importantly, the idea of Stillpoint is not just held in that room in London Bridge. The point of Stillpoint is to move beyond the walls. When I travel to meet and teach different communities around the UK and Europe I teach them about Stillpoint. About what practising there represents. Stillpoint always travels with me. I see that every room can be a Stillpoint. I see that people can create their own still point within them. Can we find our own still point in the city, whenever we need it? Can we see the world from our very own still point? These are the ideas we have cultivated here. The idea that we nurture and cultivate so that they can become part of us. What are we cultivating our practice for if not to be something we can call on to support us at any time? Stillpoint always travels with me. I see that people can create their own still point within them. Can we find our own still point in the city, whenever we need it? After Ozge died in 2012 the work I felt we were doing at Stillpoint became even more important. Her death became an incredible leveller and even though Ozge was no longer there, a part of her still existed. Stillpoint has grown since then. Stillpoint became the thing that we lost in Ozge. About love. About connection. About how we can be there for each other. Importantly, how we can look inwardly, individually but still together, to find more that is possible within us. In a room. In a city. So, the contemplative nature of yoga practice is something that I’ve begun to hold incredibly dear. 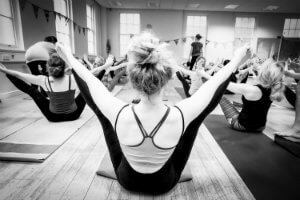 Be sure of this, in my years of practice and helping others I know we’re cultivating the spiritual nature of ourselves when we’re practising yoga. I now feel anything less than that is greatly missing the point of a yoga practice. Over the years I’ve changed within these walls. I’ve seen many others change too, as a response to this practice. But as much as I can, I’ve tried to keep the values of SYL the same. It’s evolved for sure, but the importance of keeping the quiet energy held is still there. The art of disciplined yet compassionate practice can be lost in the myriad of images, posts and statuses that continually move across our timelines. How can we present an image of compassion as the base of a practice? How can I best visually document finding compassion in the way my hands touch and are received by the floor? How can an image represent the deep love that arises around the 23rd minute of my sitting practice? All I’ve learnt is that it’s mostly about the things that aren’t shared. That perhaps can’t be seen easily. It’s in a gesture, a knowing glance, a soft realising smile. The way we feel as a response to practice is so personal, as no teacher can ever truly know what we are feeling. We (as teachers) can only help light the way with kindness, support and with someone’s best interests at heart. In my opinion practice is nurturing self love, self compassion. And if not, why not? If your practice doesn’t support a journey towards this then perhaps question your intention. Go deep and find where practice makes you come alive. We’re waking up to the love we can feel for ourselves, so we can then perhaps begin to truly love others in the same way. Can your practice become about self love, about becoming compassion itself? Go deep and find where yoga practice makes you come alive. We’re waking up to the love we can feel for ourselves, so we can then perhaps begin to truly love others in the same way. If there’s one word that has defined the last 5 years of my life it is this one. Smriti meaning to remember and Smriti as mindfulness. To remember that we have a practice we are cultivating. To remember that practice and life merge in every moment. To remember to BE compassionate. To be mindful, and to be reminded again and again of all this. Smriti (mindfulness) is yoga in action. It’s taking the practice off a yoga mat, out of a room and integrating it into the world. Seeing, in every moment, the impact of our actions. So I feel that with the name Stillpoint we chose well. Stillpoint was the name of the retreat centre in New Zealand that Ozge and I studied at in 2008. I feel I am now trying to return it back to its representation of that space within us that is our spark. The place where we move from and to. The place we can find within us, that has no walls. That’s what yoga is looking to uncover. Becoming our spark. Becoming who we are. Becoming the love we seek.